Bruc & Bruc, Barcelona, Hiszpania : Rezerwuj teraz! 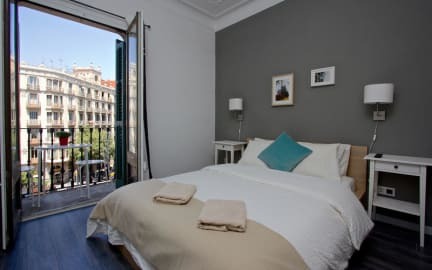 One of the most famous zones of Barcelona without a doubt (luxury bars and restaurants) and located in the heart of the Eixample Dreta of Barcelona. 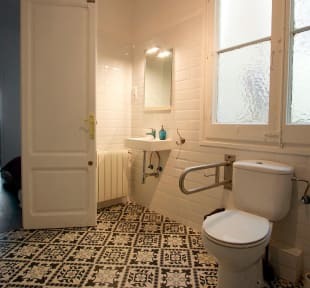 The privileged location of the apartment can be better understood if we add to this that they are “one step away' from the famous Passeig de Gràcia and Las Ramblas and minutes walking from the beaches and main monuments of Barcelona.We are just a short 10-minute walk from Plaça Catalunya – Barcelona's main square - and from the world-famous Sagrada Familia. The hostal is very close to the city's historic district, and the area is well served by metro, busses and train. Our rooms facilities include fresh linen, towels, WiFi, tourist information, common room with coffee and tea (microwave, refrigerator, coffee maker and kettle). The housekeeping is daily from 10:00 to 14:00 hours. TV, comfortable double beds separated by a wall, visco-elastic mattress 1.40 x 2.00, air-conditioning, heating, shampoo, hair conditioner and bath soap provided. Free Gym, Parking 10 € x day. Check in from 12:00 to 22:00 .After 22:00 ask details for late check in. In all cases, notify your arrival time. We do not accept customers younger 7 than years of age. No extra guests or visitors. Breakfast and Kitchen use is not included. All rooms can be locked and a key is provided to all guests. Be respectful of the neighbours and keep noise to a minimum.